The day was not over yet, so we piled back into the Jeep and drove towards the center of the island for our last hike of the weekend. We must be entering a hunting area. 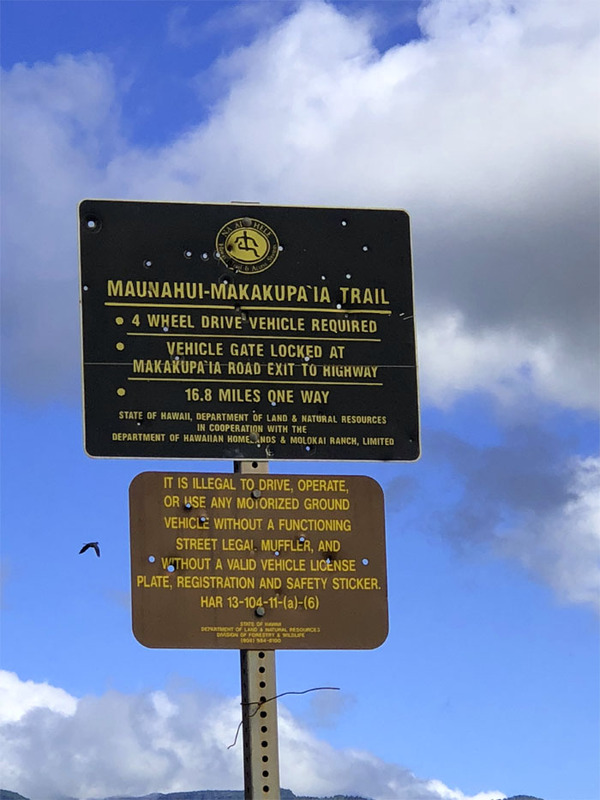 I think one would be hard pressed to find a sign in any hunting area that is not riddled with bullet holes. Photo by Analyn Baliscao. It was time to see what our Jeep could really handle on this rugged trail. It would not disappoint. The sweet smell of eucalyptus trees greeted us as we entered the public lands established in 1912 to maintain and protect the watershed. Stopping at the Sandalwood Measuring Pit, a hole that was dug in the early 1800’s to mark out a ships capacity to carry the fragrant trees, which when full was then taken down to ships headed to China. An export that eventually brought hardship to the local population through the sandalwood tax that forced them to cough up 66 pounds of the scented wood, which resulted in the near extinction of the ‘iliahi forests and widespread suffering among those who were forced to harvest the heavy yellowish wood. 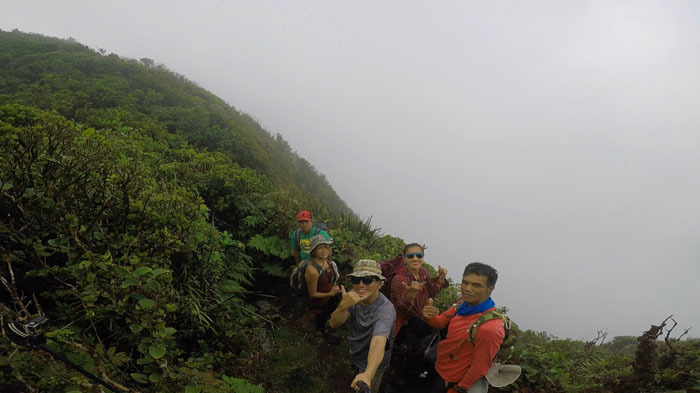 Trade wind clouds had gathered at the overlook, obscuring any views and chances of stopping. Nothing to see here. Drive along. Photo by Analyn Baliscao. 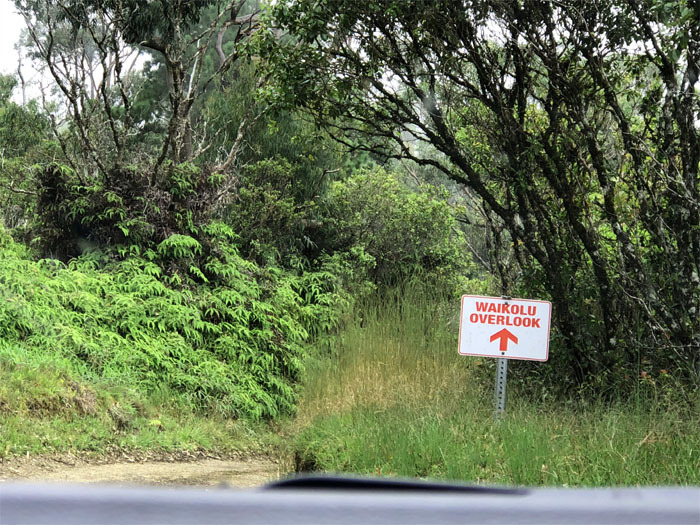 Entering the 2,774 acres of montane forest home to native fauna and flora, also home to Kamakou which at 4,961′ high, is the highest mountain on the island. The trail soon turned into mud puddles and deep ruts, that was deftly handled by Ferlino’s driving skills. 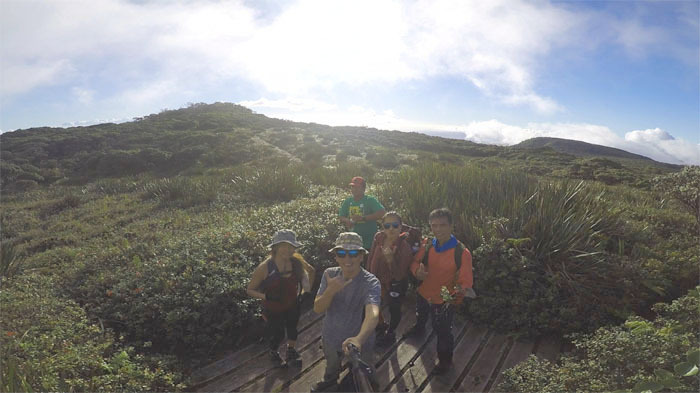 Left to the bog and right to the trail that leads to the 3,951′ summit of Pu’u Kolekole. 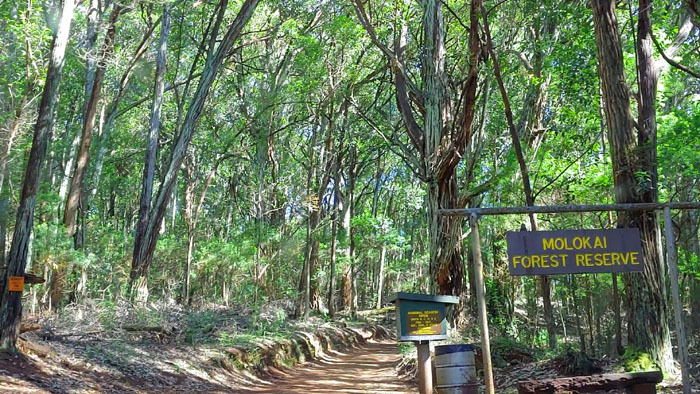 Entering the oldest bog in the Hawaiian islands. The boardwalk that was built in the mid-1980s is slowly falling victim to the very environment it is protecting, as sections are rotting away into the pungent mud. Walking on the narrow, tilted and sagging boardwalks was like being on a balance beam with the suspension of thick mud. Breaking out of the forest into the open plateau where we followed the sign to stay on trail. Making our way through the primordial forest that is constantly refreshed from the moisture laden clouds that sweeps through the plateau. We turned around at this point as time was running out and we couldn’t see the summit for the clouds, let alone any views of Pelekunu Valley. We’ll be back. 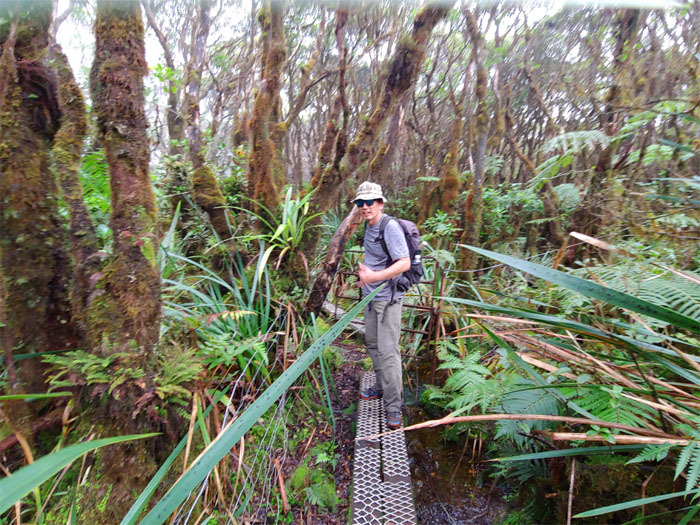 Making our way back out from one of three accessible bogs in the islands, the other two being Alakai Swamp and Mount Ka’ala. Closing the weathered gate behind us that was on its last rusty hinges. Photo by Ferlino Carinio. 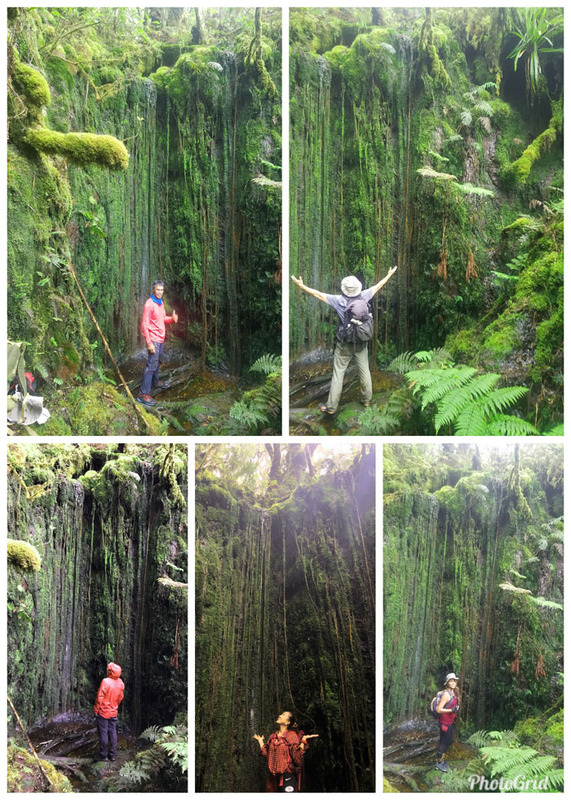 Looking up at the waterfall that were more hanging vines than waterfalls. Everybody had to get their 15 minutes of dripping vines. Catching the sun poking through the moss covered trees, shrubs and ferns on our way out. Group photo on the platform surrounded by the stunted flora. Leaving the “shrimp crushed” bog. 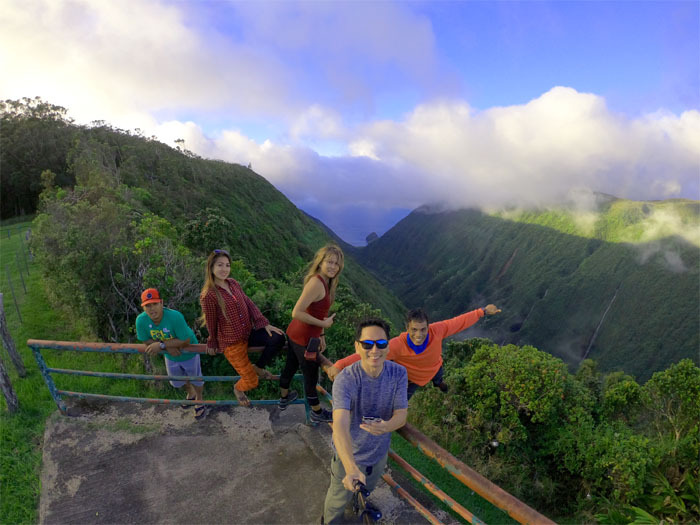 On our way out, we stopped at the 3,600′ lookout to enjoy the stunning panoramic views of the valley with a rainbow thrown in for good measure. Looking into Waikolu Valley with her white ribboned waterfalls cascading down the side of the mountain. Our last group photo of the day. The sun was setting over the campground, pressing home the need to end the photo shoot and continue our way back down. 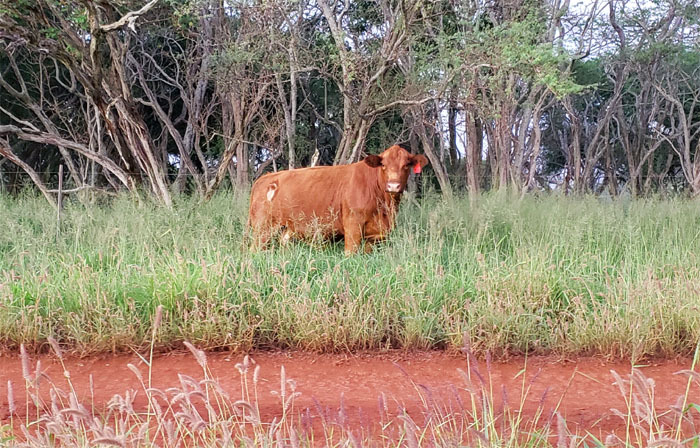 The lower part of the trail crosses through Molokai Ranch property which accounts for the cattle grazing on both sides, some were a little too close for comfort. I like my beef rare, not stare. Clocked our total mileage for the day at 25.5 miles, but most of that was chewed up by the jeep. The actual hike was probably only a couple miles round trip. We bounced down the road chasing the sun so that we could drop Chris off at the airport to catch his early flight, while the rest of went to town looking for a car wash since we did treat the Jeep like a 4×4. No such luck as everything was shutting down at 7pm. Luckily we ran into a friendly islander who let us borrow his hose to wash off the mud splattered Jeep. Andrew Jackson meet Leighton Penki. All that rushing turned out to be for naught as our plane was grounded due to mechanical reasons. We got to spend an extra hour on the island with vending machines that did not take our money. 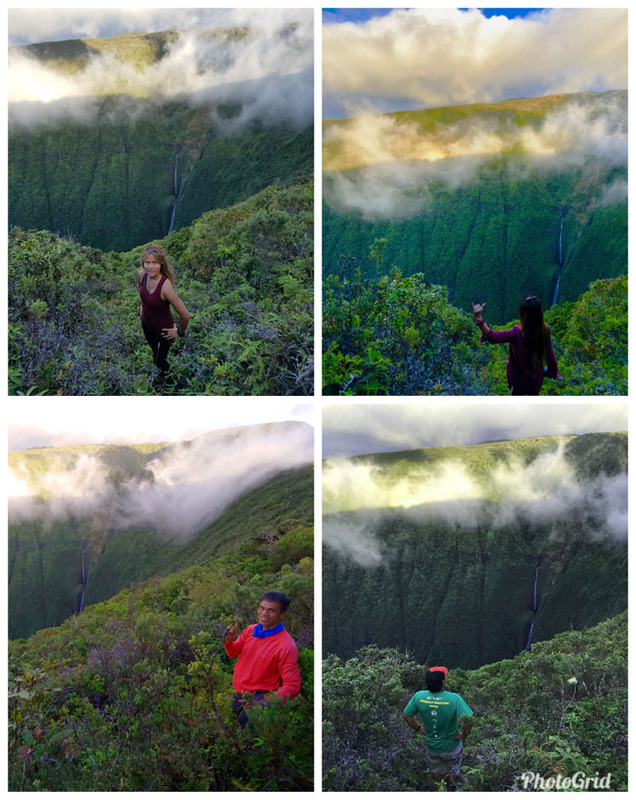 Mahalo Molokai for the awesome weekend and adventures with good friends. Thanks to Jasmin for picking us up at the airport and the late night supper at Zippy’s.